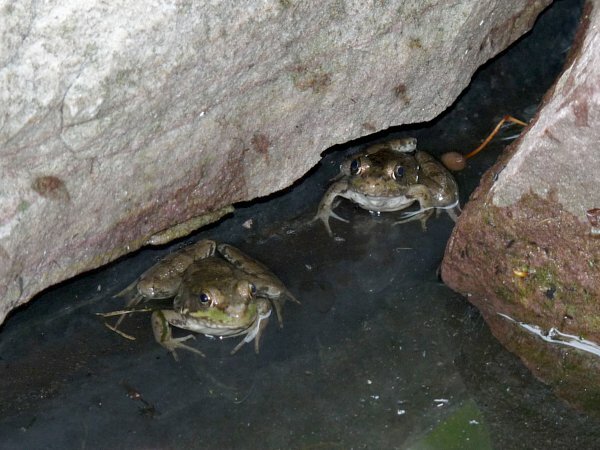 The unusually dry summer must be driving the frogs to my garden pond. 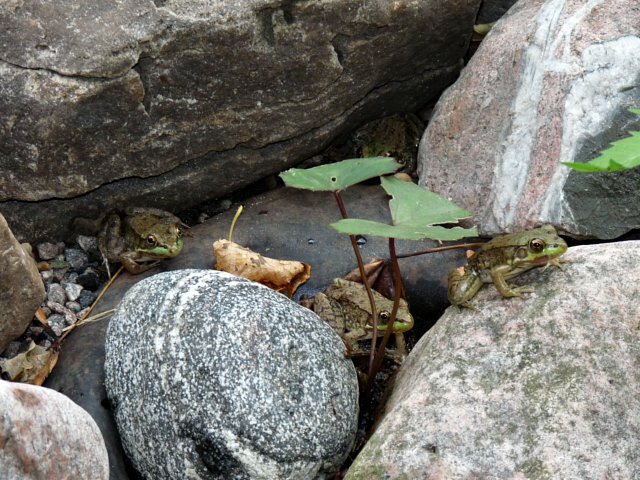 I’ve never seen so many frogs in the pond. I counted 43 in and around the pond and I know I missed more than a few. The stream that feeds my damned pond has been dry for weeks, normally it may dry up for a week or two at most during the summer. Even a light rain is usually enough to keep the stream flowing since it drains 100s of acres on the hillside. The last frog spotted here as long since moved on. I’m amazed to see the swamp surrounding the property turn dry as a bone. I have never seen it dry before. 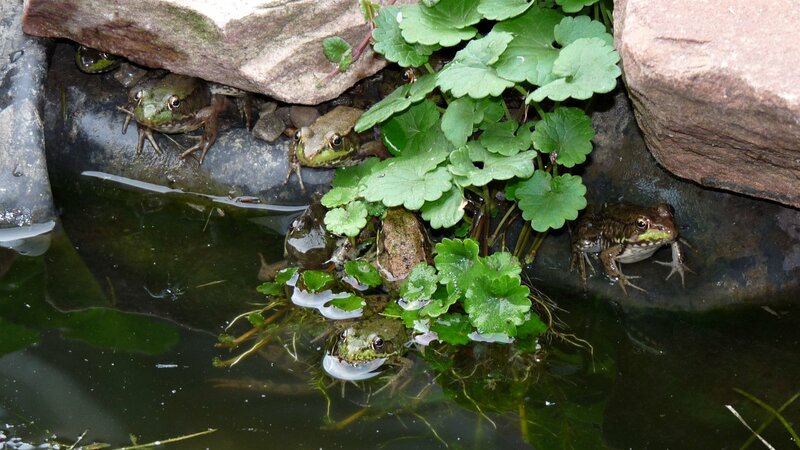 It’s no wonder the frogs are seeking refuge in my little pond. Small as it may be there’s plenty of room for more. Although one seems determined to become top frog. Draw a circle around the wrist and fingers of the top frog and what do you have? A peace sign or the hand of a Martian from War of the Worlds? 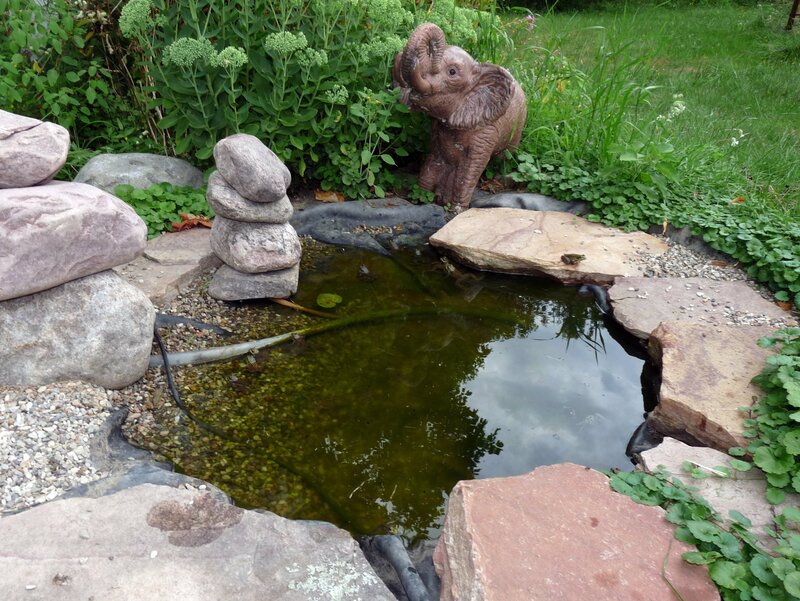 Even my fountain workshop pond is crowded with frogs. The high count so far is 27. I won’t make you guess how many frogs are in the photo. There are 18, if ya don’t believe me use the link to see a full sized copy and count them yourself. This is my favorite photo of the day. I didn’t realize just how many frogs were in it until I opened it up on the computer. It’s hard to see all 8 of them in a reduced copy so I also made a larger version to use as my new desktop wallpaper. Hint – you can’t see much more than an eye of two of them. If you’re wondering, the ground cover around the edge the fountain pond is Gill Over the Ground – Glechoma hedercea. Most people consider it a weed but I like it and think it looks good here. Yes, gill over the ground looks good there–just not in my flower patch or tomatoes. 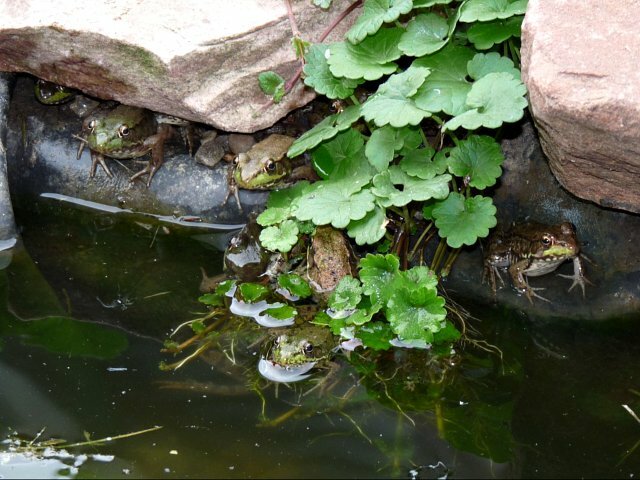 Fun to see so many frogs in your water garden, all look like Bullfrogs, fitting isn’t it? 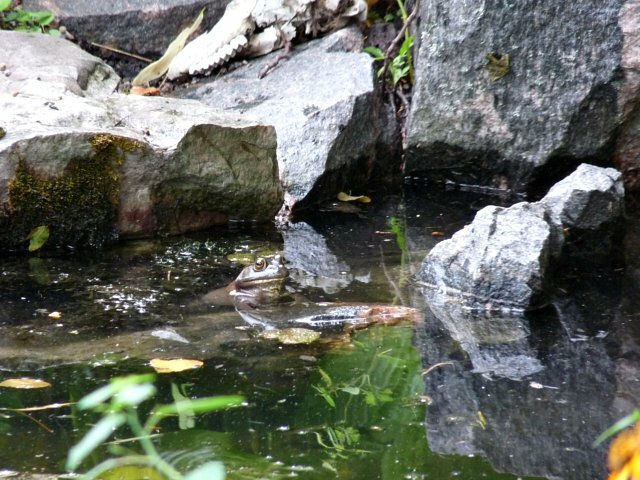 Woke up to Bullfrogs and Green Frogs calling this morning. I am really tired of the heat and ready for Fall weather. With all the hot dry weather this year, I’m sure your frogs are very grateful you have some moist habitat for them. I’ve noticed how much more the birds are venturing in toward our house, by the fountain, now the creeks have almost dried up. It’s just as challenging for the wildlife, as the humans, during summers like these! First picture is of Mycena leaiana, maybe the second one too. Lovely! 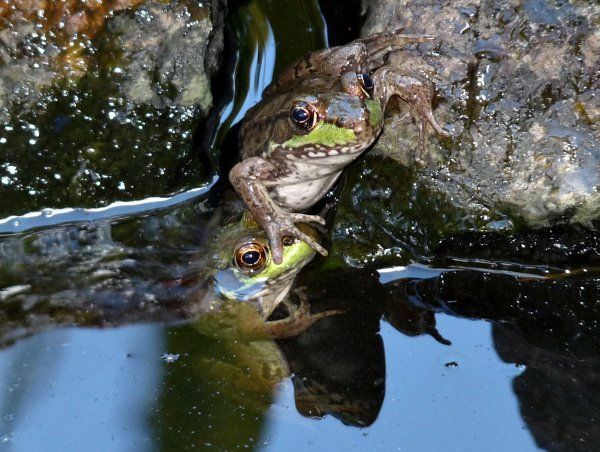 and just between us, I really wish that could kiss you and Stewy on the nose and turn us all in to frogs for an hour – just for a little while – so we could frolic with your handsome friends. (wouldn’t that be fun?) The little ‘weed’ reminds me of henbit, which smells heavenly when freshly mown!